A new service that is offering privacy protection when you browse the web was announced Sunday. 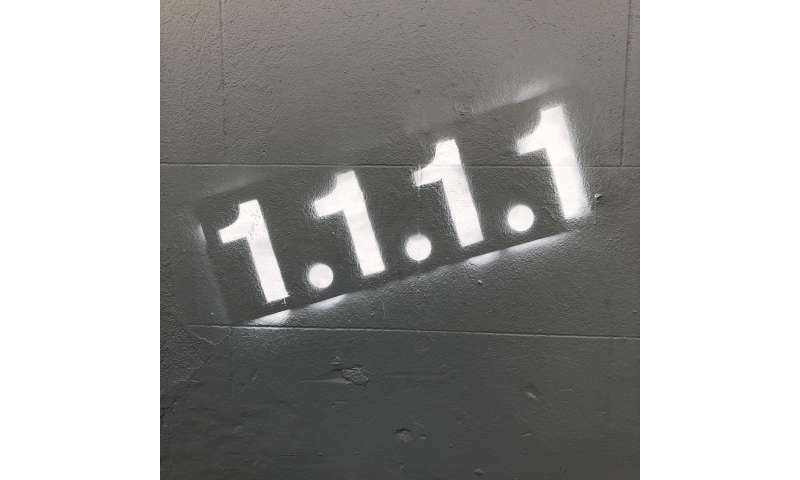 The security company Cloudflare is delivering a consumer DNS service called 1.1.1.1. Odd name? Matthew Prince blogged that the reason is "we're geeks at heart. 1.1.1.1 has 4 1s. So it seemed clear that 4/1 (April 1st) was the date we needed to launch it." Nearly everything on the Internet starts with a DNS request. DNS is the Internet's directory, said the 1.1.1.1 website. Two key benefits to their service are a speedier Internet connection as well as privacy. Tom Warren, senior editor, The Verge, on Sunday: "Cloudflare is focusing heavily on the privacy aspect of its own DNS service with a promise to wipe all logs of DNS queries within 24 hours." "You're two minutes away from browsing a faster, more private Internet." While speed gains are attractive, it is the privacy feature that will most likely draw considerable interest. People tend to get used to days of continued rain, favored roads closed for construction, unsolicited phone calls but the very notion of attempting to monetize on a person's browsing data is not sitting well. "Your ISP, and anyone else listening in on the Internet, can see every site you visit and every app you use—even if their content is encrypted. Creepily, some DNS providers sell data about your Internet activity or use it target you with ads. We think that's gross. If you do too, now there's an alternative: 1.1.1.1." Will many welcome this as an alternative to traditional providers? The imperfect known is possibly less scary than the unknown. Nonetheless, Cloudflare is vocal about how seriously it regards privacy. "We will never sell your data or use it to target ads. Period." They said they will never log "your IP address (the way other companies identify you). And we're not just saying that. We've retained KPMG to audit our systems annually to ensure that we're doing what we say." KPMG, they said, is to audit their code and practices annually along with a public report. The https://1.1.1.1 is being referred to as an actual "DNS resolver." So, as Wired explained, "The idea behind Cloudflare's service is that instead of using the DNS service offered by your broadband provider, you would go into your operating system's preferences and point to 1.1.1.1." The 1.1.1.1 announcement represents a partnership between Cloudflare and APNIC (Asia Pacific Network Information Center). What is APNIC? It is the Regional Internet Registry administering IP addresses for the Asia Pacific. It describes itself as a "not-for-profit organization, whose primary role is to distribute and manage Internet number resources (IP addresses and AS numbers) in the Asia Pacific region's 56 economies." In the bigger picture, Wired called out the issue of tracking. "Various tools can help you block this type of tracking, but another big window into your browsing habits remains. Your broadband provider or someone who has hijacked your internet connection could still see what sites you're visiting." Seeing online actions cues them into marketing and advertising relevant products instead of just shooting blind. According to the Cloudflare blog, "even if you're visiting a website that is encrypted—has the little green lock in your browser—that doesn't keep your DNS resolver from knowing the identity of all the sites you visit."